Even if our longest-serving Mayor Tom Menino hadn’t died so soon after leaving office, today would have been strange. 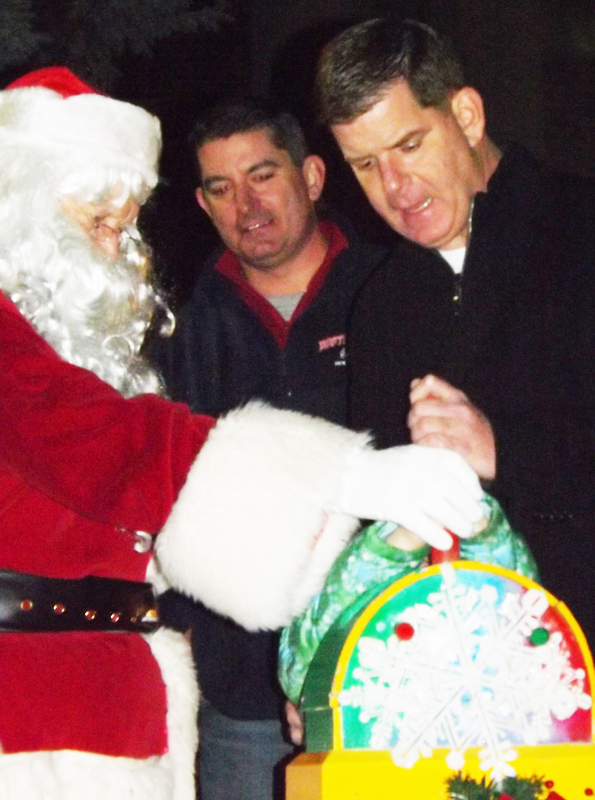 His replacement, Marty Walsh, threw the light switch on the Christmas tree in Logan Square. That’s in Hyde Park, Menino’s part of Boston (and mine). As a city councilor, then mayor for so long, Menino was the tree guy. He loved the square, the event, the happy kids, the young step dancers and other performers, greeting the constituents, and showing off his phenomenal memory of our names and details. One year when he was ailing, his wife Angela, stood in and up for him, but this was different. A tree lighting without Tom Menino is a shock to the HP psyche. Let me note that Walsh did well. I don’t know if he has it in him to be as charming, as avuncular, and as jolly as Menino. I can leave it for others who did business with the city to haul out their favorite vignettes of how Da Mare could, would and did figuratively break their knuckles in negotiations. As a constituent I never experienced that in my decades of dealing with him. License note: All pix are Creative Commons-Attribution. Do wh at you want with them. Just give Mike Ball credit once. Walsh is a passable pol. 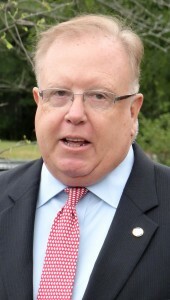 He got elected and reelected to the MA House then the mayoralty. Oddly enough though today in Logan Square, he seemed to get a lot more pleasure out of high fiving the kids than he did glad-handing the voters. Could the new Mayor be shy? The crowds were also passable. I estimate that half to two-thirds as many who showed as in previous years. That was surprising in that we had relatively balmy 4:30 PM weather. It’s gotten to be a very localized joke that the event brings snow, sleet, bitter cold and strong winds. However, as always, the kids had a good time. There were silly rides for the littlest ones, fried dough and cotton candy for the shameless and those with strong stomachs, and draft-horse cart spins about. 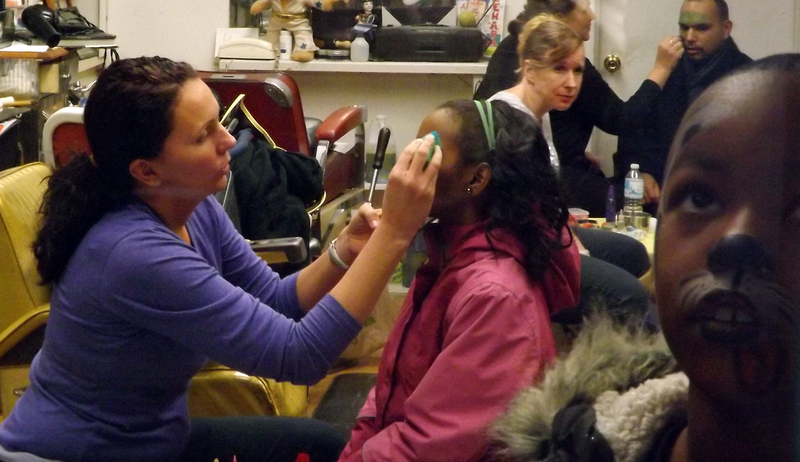 Oh, yes, and the face painting occurred in the Logan Square Barber Shop. That’s where I get what little hair I have trimmed. I found it peculiar that while the barbers were not doing the deeds, kids adults alike were in the three chairs getting done up like tigers or with Patriots’ logos on their cheeks and foreheads. On the dais, we had the usual suspects — Santa, Rep. Angelo Scaccia, District Councilor Tim McCarthy, At-Large Councilor Steve Murphy. the commander of the local police precinct and such. In no surprise, I kept overhearing the lament of no-Tom-Menino. That’s certainly not Walsh’s fault, but he has a lot of history against his back. The Mayor is Dead. Long Live the Mayor. It’s the season or at least a season. The recently retired and more recently dead former Mayor Tom Menino clearly had a big saved spot in his big old heart for Christmas and its leading events. 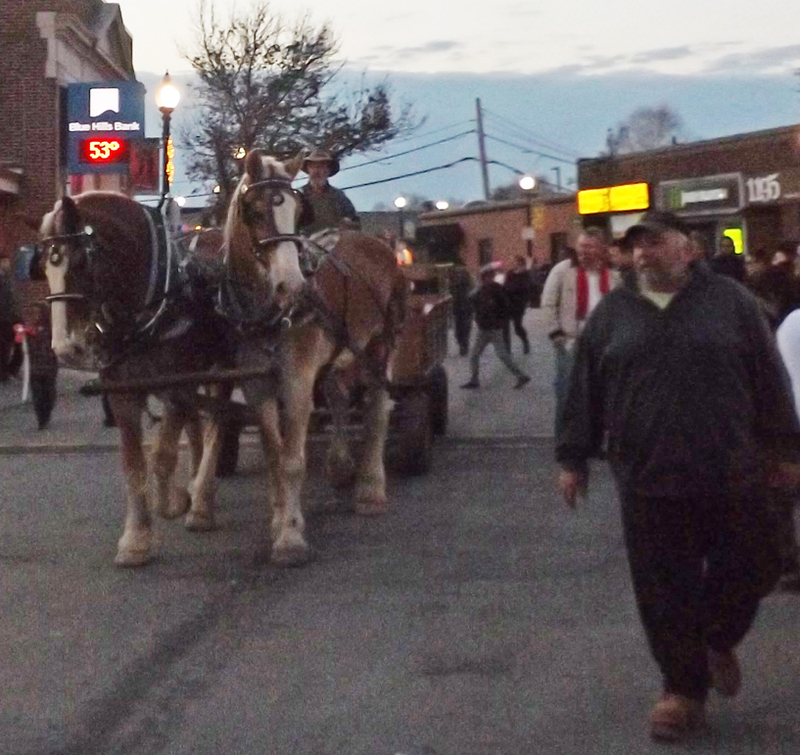 He went by Escalade from one Boston neighborhood to another, shameless in his enjoyment of the holiday trolleys and tree lightings. He seemed to be everyone’s dad or granddad. 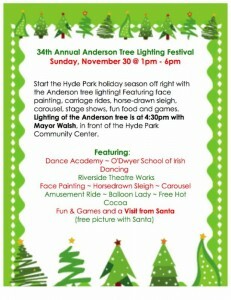 I can only recall him once missing the lighting of the Anderson tree in our shared Hyde Park neighborhood. He was too feeble that year. His wife Angela stood on the platform for him and performed his greetings and wishes. That itself was remarkable. For decades, she had preferred to have her people-loving hubby meet-and-greet. Even on the annual July 12th block party celebrating the city while celebrating Tom’s ascendancy to the mayoralty when Ray Flynn scurried off to the Vatican with delusions of legacy and maybe even closeness to God, Angela absented herself while Tom stood in the street glad-handling and chatting up us all. Yet when needed, she did not let her husband down. She became the first lady of the city. Now Martin J. (Marty) Walsh rolls into Menino-land in eight days to figuratively flip the switch and by so doing stake a local claim. I”ll be there to see how he carries himself. So far, the new version of Da Mare has not been as visible in these parts and certainly has not brought the personable Menino character. I’ve observed him at several events and found him rather dour in contrast to the avuncular Menino. There may be some jollity in him, but he doesn’t let it out much. I admit that to Tom Menino I was a constituent. He treated me as such. I had many contracts with him, at political events, when he was a guest on my Left Ahead podcast, when I advocated for or thanked him for bicycle doings, at business openings, in random meetings, and of course at the annual tree lighting. He remembered…my name, my precinct, that I was a poll warden, that I shared his love of cycling, that I’d moved from JP to HP (the proper order of things in his judgment, that I had healed from a badly broken leg when he was having his own nether region problems, what my sons had been about. In other words, he was both an empathetic guy and a skilled pol. I never saw the allegedly hard-boiled Mr. Mayor. I thought of that recently when a police officer who had been one of his union’s officials involved in contract negotiations fairly snorted at the lore of the late Mayor. He saw the thunderbolts and said there definitely were two distinct sides to him. 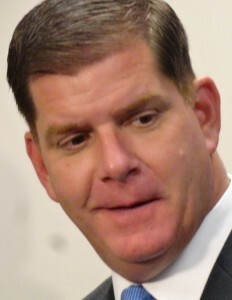 So hail Marty Walsh, the obscure state rep following the longest serving, fervently popular chief exec of Boston. He inherited the stereotypical urban ills of crime and unemployment, but primarily a city in very good shape. Now what? Tom Menino always seems to have been Tom Menino. He was personable and above all else loved both his city and its residents. He seemed to recharge with every moment taking your hand or learning more about you — interests, problems, anything. So far, Walsh has lacked the tiny, constant Menino touches. For one, as a long-time poll worker, I think of the preliminary, primary and general election days. A few pols, like Rep. Liz Malia, show up at polling places with coffee, doughnuts or sandwiches for those of us who spend 14 or 25 hours there. Menino’s people never missed an election or a polling place. I thought too of the day of Menino’s sudden death announcement. Coincidentally, Walsh was scheduled to appear on River Street in Hyde Park to dedicate a pocket park, really a dreadful patch of paving stones next to a convenience store, badly in need of what my grandmother would have called a bum bench. Walsh didn’t show. The half dozen of us there in case he did were not surprised. On the other hand, Tom Menino would never have left constituents hanging. He either would have had an aide appear to announce a postponement or would have gotten a cop from the station across the street to do that. I’ll be fascinated to see how the new Mayor handles hoi polloi. You are currently browsing the archives for the Walsh category.